Salvesen Crescent overnight fire badly damaged two houses. 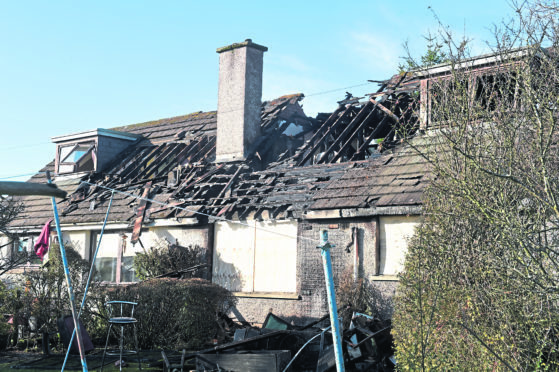 Two pensioners fled from their homes after a fire broke out in the night. Neighbours frantically banged on Colin Ross and Isobel Telfer’s doors to waken them as the flames spread along the roof of the two houses in Alness. Firefighters raced to the scene on Salveson Crescent at about midnight. Mr Ross, 74, and neighbour Isobel Telfer, 80, both managed to get to safety but their homes have been badly damaged. Mr Ross was taken to hospital. Neighbour Victoria Davis was one of the first on scene. She said: “I heard the fire alarm going off around 12.10am. I called 999 and then I heard the second fire alarm. “I got up and ran straight across. He was already outside sitting on the door step so we moved him across away from the house. Another neighbour, Marlene Campbell said she had seen the red of the flames in the sky as she headed to bed at 12.15am. “I thought I would peer out and see what the weather was doing,” she said. “I saw the red flames coming out of the back door. I ran and opened the front door and there was no sign of any fire brigade so I phoned them but they were already on their way. Three crews tackled the flames through the night, and attended again yesterday to dampen down the scene. A spokesman said: “The Scottish Fire and Rescue Service was alerted at 12.09am on Wednesday, February 6 to reports of a fire within a dwelling on Salveson Crescent, Alness.